There are many ways to recycle old coffee cans, from waste baskets to storage containers to flower pots, but one of the most fun is to upcycle a can into a birdhouse. While there are many ways to turn a coffee can into a birdhouse, this easy project is suitable for a wide range of birds and requires no woodworking experience, very few tools, and just a few minutes to complete. A large coffee can is the ideal size for a general purpose birdhouse and will suit a wide variety of birds that use houses. Either a plastic or metal can is suitable, and while metal may be more difficult to work with and can get hotter for the nesting birds, it is also more durable and offers more of a rustic appeal. A plastic can is less aesthetically pleasing and the bright colors may catch predators' eyes, but it can be easier to work with, particularly for young birders interested in making an easy birdhouse. The can doesn't need to be just a coffee can to make a new birdhouse. Any similarly sized can, such as large economy sizes for fruit, pudding, juice, nuts, or other canned foods can be used for this project in the same way. Before the can is turned into a birdhouse, it must be thoroughly cleaned and all coffee or other food debris should be removed. Not only could this debris attract insects, but predators could smell it more easily and therefore find the birdhouse. To clean the can, wipe away any loose debris (soaking the can can help), and use a small brush to scrub out the crevices. Rinsing the can in a weak bleach solution can help remove any lingering odors, and then rinse the can in clean, clear water to remove all chemicals. Any paper labels on the exterior can be removed, and doing so will not affect the usefulness of the house. If the can is rusted inside, use a steel wool or copper pad to remove the rust layer, but exterior rust can be left alone for a weathered look if desired. Once the house is completely dry, use an awl, drill, or nail to puncture drainage holes in what will become the bottom of the house. A half dozen holes is sufficient, but stagger their placement so they will not all be covered with nesting material by the resident birds. To minimize any injury to the birds, use a metal file to dull any sharp edges on the inside of the holes. At the same time, add several holes in the top third of the can for additional ventilation, but avoid putting them at the very top where leaks on rainy days will be more prominent. The entrance to the birdhouse can be created in two ways. If you prefer a nesting shelf or ledge that will work for robins, doves, and other larger species, simply discard the can's lid and the entire front of the can will remain open for easy access. If you prefer a home for smaller birds, such as wrens, chickadees, or nuthatches, use heavy scissors or a craft knife to cut a 1-1.5-inch hole in the can's plastic lid. The entrance hole can be centered or slightly above center, but should not be low on the lid to minimize the risk of hatchlings accidentally falling out. Fit the lid snuggly back onto the can, and the house is ready to use. 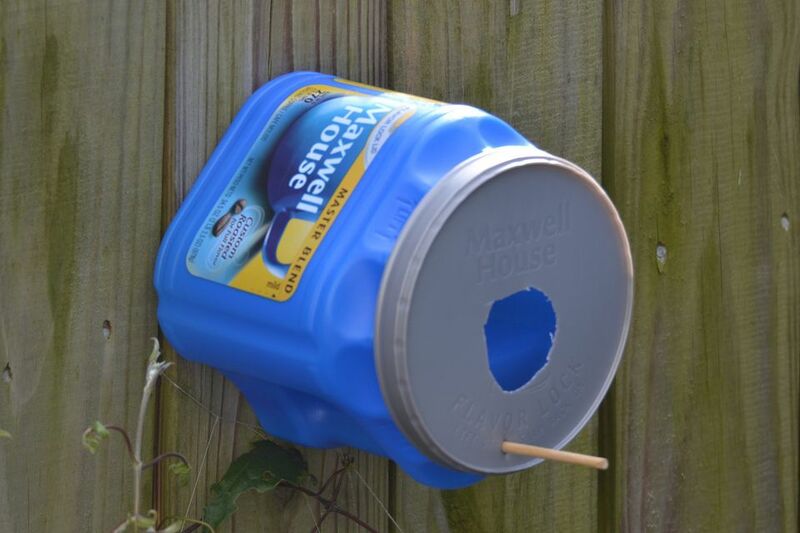 This simple coffee can birdhouse can be easily mounted with nails or screws through the bottom directly to a tree, fence post, or building wall. It can be helpful to use an awl from the inside of the can to puncture holes to make putting in the screws or nails easier, and using 2-3 to fasten the house will ensure that it does not swivel or fall easily. Ideally, the house should be mounted under an eave or under branches that will provide some additional shade and shelter, or a simple V-shaped wooden roof can be placed over the house and secured with glue, so long as any ventilation holes are not blocked. To further protect the house from unwanted invaders such as raccoons or snakes, consider adding a baffle underneath it or taking other steps to discourage bird house predators. Adding a source of nesting material nearby will encourage birds to take up residence. While a metal or plastic birdhouse will be more resistant to infestations of mites and other insects, proper cleaning is essential to keep the house attractive to nesting birds. After each nest of birds has grown up and left, remove the old nest and rinse the house with a weak bleach solution to sterilize it. Check that the ventilation and drainage holes are clear and verify that the house is securely mounted, and a new family will be moving in before you know it. Recycling is a great way to be a green birder, and recycling an old coffee can into a new birdhouse is an ideal way to be eco-friendly and bird-friendly at the same time. Add a teapot bird house or plastic bottle bird feeder to your garden as well, and you'll be sharing all your favorite beverages with the birds. Want to make another unique birdhouse? Try this DIY mailbox birdhouse project!